Box Text: This is an ancient story - a time when men and gods lived together. The peaceful village of Elis was the home of the fairest maiden and a gentle yet brave your man named Orpheus. Helene and Opheus swore eternal love to each other. But alas, one day, Helene fell victim to the fangs of a venomous serpent and was turned to stone. Your adventure will take you through ancient Greece on a classic mythological quest. It may be easy to defeat the snakes and centaurs that inhabit most of the cities but how will you defeat Hydra? Or the terrible three-headed dog, Cerberus? You'll need to use all of your adventuring skills to find the magic items that will allow you to rescue your beloved Helene. - Beautiful detailed graphics depicting the ancient lands of Greece. - Outstanding soundtracks and musical effects. - Password feature allows players to continue quest in progress. 03-24-2012 scott Box Text This is an ancient story - a time when men and gods lived together. The peaceful village of Elis was the home of the fairest maiden and a gentle yet brave your man named Orpheus. Helene and Opheus swore eternal love to each other. But alas, one day, Helene fell victim to the fangs of a venomous serpent and was turned to stone. Your adventure will take you through ancient Greece on a classic mythological quest. It may be easy to defeat the snakes and centaurs that inhabit most of the cities but how will you defeat Hydra? Or the terrible three-headed dog, Cerberus? You'll need to use all of your adventuring skills to find the magic items that will allow you to rescue your beloved Helene. 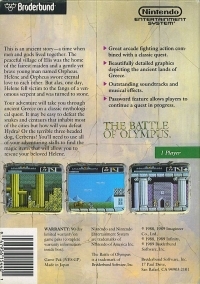 - Great arcde fighting combined with a classic quest - Beautiful detailed graphics depicting the ancient lands of Greece. - Outstanding soundtracks and musical effects. - Password feature allows players to continue quest in progress. 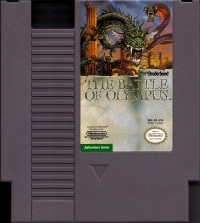 This is a list of VGCollect users who have Battle of Olympus, The in their Collection. This is a list of VGCollect users who have Battle of Olympus, The in their Sell List. 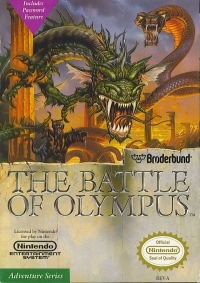 This is a list of VGCollect users who have Battle of Olympus, The in their Wish List.